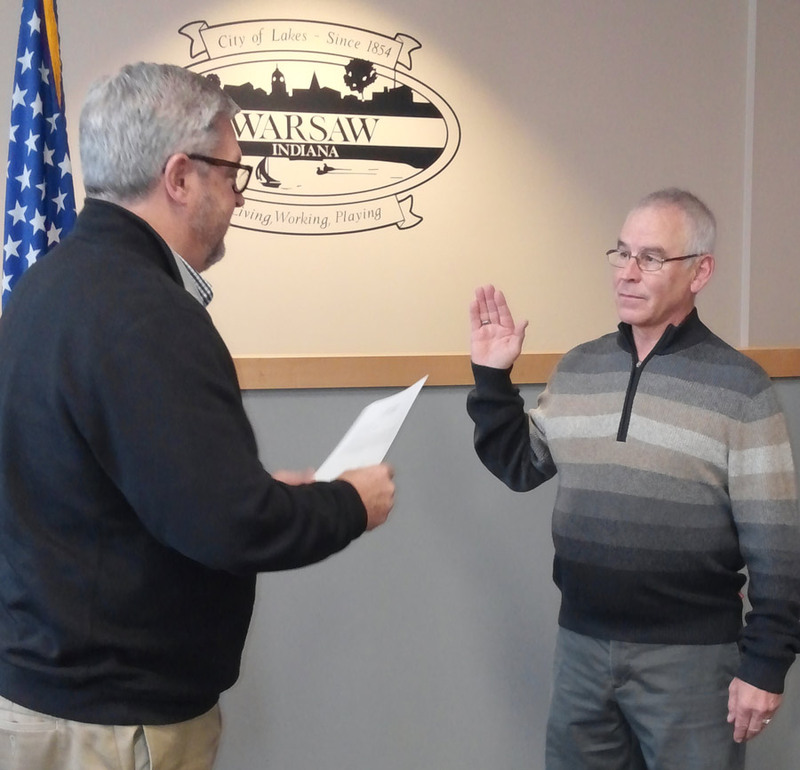 Warsaw Mayor Joe Thallemer administers the oath of office to Dan Smith, new member of the Warsaw Board of Zoning. 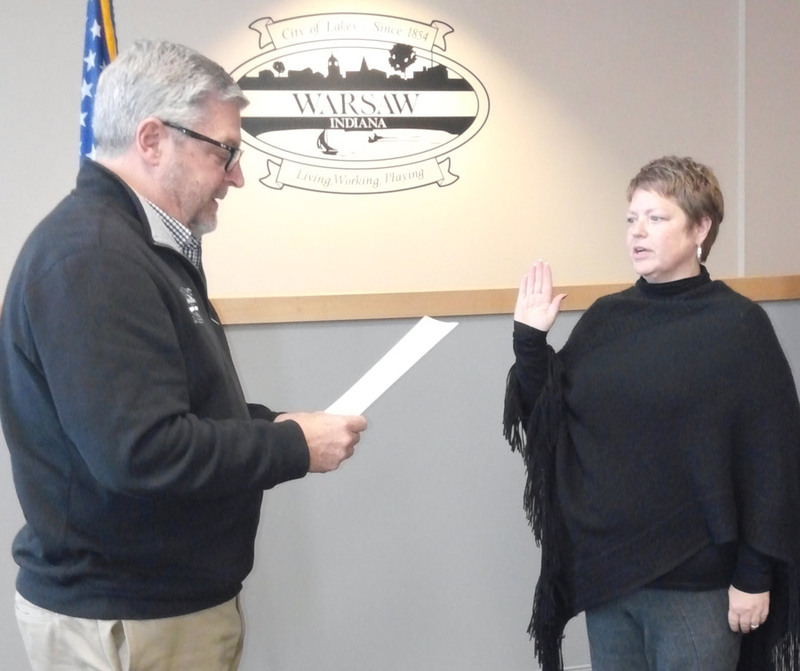 WARSAW — Before the approval to spend funds, Dan Smith and Michelle Boxell were administered the oaths of office at the Warsaw Board of Public Works and Safety meeting Monday morning, Jan. 4. Smith will be serving his first term on the city’s board of zoning appeals. Boxell will be serving her second term on the parks and recreation board. 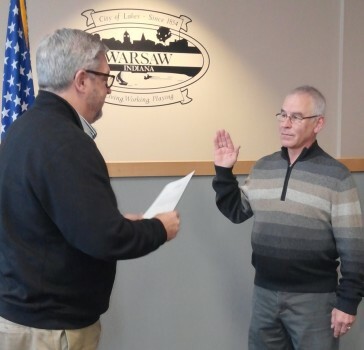 The oath of office was administered to each by Warsaw Mayor Joe Thallemer. The remainder of the approximately 80-minute meeting was spent approving expenditures for various departments and projects. A number of the approvals included contracts for the 2016 concert series hosted by the parks and recreation department. Larry Garner, Blues & BBQ Headliner on July 8 for $2,500. Additional contracts approved for park and recreation department programs were: Jeremy VanLue, DJ for Daddy’s Little Sweetheart Dance, Feb. 5, for $300; Our Father’s House for catering for dance, $862.50; Driveline Coffee to cater beverages for Coffee and Canvas program, June 21 and Sept. 16, for $280; Kara Schafer, canvas painting instructor for Coffee and Canvas program, for $150; two contracts for Charles Ray Jr., fly fishing workshop instructor, May 21 and Aug. 27, morning and afternoon, a total of $270; and two contracts for Rebecca Anglin, instructor for zumba, morning and afternoon, a total of $720. Approval was given to Sheila Wieringa, recreation director, to apply for a $5,000 Kosciusko County Convention, Recreation and Visitor Commission grant to purchase 10 paddleboards and necessary equipment to utilize for a free community paddleboard program and low cost paddleboard clinics. BOW members approved the signing of an agreement with Leads Online, a cost of $2,462. The company operates and maintains an electronic reporting and criminal investigation system for receiving and disseminating data for all pawn/secondhand stores. Warsaw-Wayne Fire Chief Michael Wilson was given approval to apply for a FEMA Assistance to Firefighters Grant to purchase upgraded radio equipment. Currently fire officials have to utilize two different radios to communicate with emergency medical services, Indiana State Police, and fire operations within Indiana Department of Homeland Security District 2. These agencies operate on 800 MHZ frequencies. The local department, county and city police departments operate on VHF frequencies. The new communications radio system will allow the department to be compliant with the new state level P-25 compliant radios, without the use of multiple radios. The projected cost of the project is $246,000. If awarded the fire department would provide a match portion of approximately $22,376. This would be for 33 radios. One other piece of equipment, a 2016 Bobcat, was approved for purchase by the parks and recreation department. Larry Plummer, superintendent, stated two quotes were received with the lowest bidder being Bobcat of Warsaw. The purchase price is $1,800 which includes trade-in and a municipal discount. The other quote was from Bobcat of Warsaw, at a quote of $9,078.